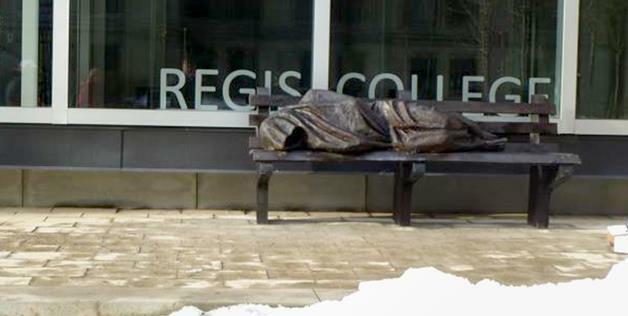 When I first heard that the statue was to be installed next to the front door of the college, I thought it was a mistake. Being set twenty feet back from the road and up a couple of steps, I predicted that many passers-by would not even notice it. Surely it would have been better next to the sidewalk? However, the artist knew better than I, and the statue has been anything but invisible. In retrospect, there are a couple of reasons why its location is in fact well-chosen. First, having the piece removed a bit from the bustle of the sidewalk is a good way of representing the virtual separation of the homeless from the consciousness of the rest of the city of Toronto. Although they are always present, we have many ways of placing distances between ourselves and the indigent among us. But, as Mother Theresa shockingly reminded us, they are Jesus among us in his “distressing disguise”. Second, many passers-by do notice the statue despite its being set back a bit. In fact, because it is a distance from them, they will often stop to figure out what they are seeing. In certain lighting conditions it can look quite life-like, so some people wonder whether it is a real person or a bronze and decide to take a closer look. The dean of Regis College, Fr. Gordon Rixon, S.J., says that he has frequently paused from his busy schedule in the college to watch discretely from the window as pedestrians (and sometimes even drivers (!)) interact with the artwork. He has several interesting stories of people’s behaviour as they come to realise what the statue is about. I myself witnessed one such encounter. One day, I was looking out the front window of the college and saw a man wheel his bicycle up to the statue. He had evidently been there before and had come back to visit. From his shabby clothes, I reckoned that if he was not homeless, he was at least down and out in some way. He propped up his bicycle, reached out to touched the statue, and then stood there for a few moments in silent prayer. Then he continued on his way. 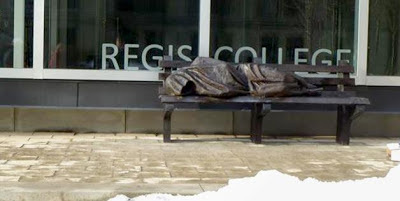 Jesus the Homeless did for that man what good religious art ought to do: it helped him to grow closer to the Lord. May it do so for many others who pass by the front doors of Regis College.